> Research Library > LogMeIn > Problem Solving and Product Information - Live Chat Works! Problem Solving and Product Information - Live Chat Works! 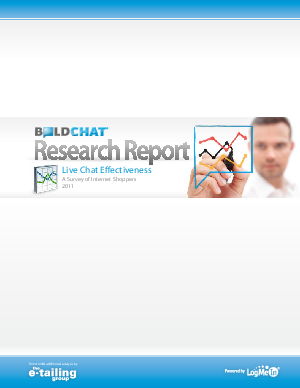 Does the live chat technology influence purchase intent? How effective (or annoying) is one particular live chat feature - proactive invitations? What kind of best practices can be gleaned and introduced from understanding the shopper's perspective about the technology? Access this resource to uncover the results of the survey including the top 5 conclusions they uncover. Take a closer looks at the feelings and opinions of live chat from real users and uncover if this technology can help - or hinder - your business.